Ask fellow campers about "Duke's Slickrock Grill, Campground and RV Park" and nearby attractions. Great location, quiet nights and nice views. The brisket at their restaurant is worth staying for. Our only negative is that the laundry facility was very dirty. We camped at Duke's Slickrock Grill, Campground and RV Park in a Motorhome. This park was basically a huge gravel lot behind the restaurant with full hookups. There was plenty of space, and the park wasn't very busy. 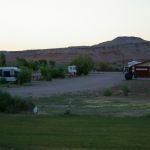 The surrounding landscape is beautiful, and the location is conveniently close to both Capitol Reef National Park and Goblin Valley State Park. It's a good location to stay at if you want to visit both places. AT&T cell service was very good (though 3G, not 4G/LTE). WiFi was decent but not great. There was no recycling, which was annoying. We camped at Duke's Slickrock Grill, Campground and RV Park in a Fifth Wheel. Don't miss Goblin Valley! There's a bare-bones market nearby in town and a handful of restaurants, and you could reasonably walk to any of them in town. Duke's restaurant was good enough. Decent CG with good WIFI. My site was in the newer section for 40' + RV's. Long & wide enough to park my tow beside. Dusty when Windy. Very quiet. AT&T cell ok & Data slow with 5 bars of 3G. Dish Satellite good. Was here to visit Capitol Reef National Park 37 miles west of here. We camped at Duke's Slickrock Grill, Campground and RV Park in a Motorhome. Basic gravel campground with no shade. Large grass pet area which was nice. Good location to visit Goblin valley 25mi away since the GV campground doesn't have hookups and it gets hot in August. We camped at Duke's Slickrock Grill, Campground and RV Park in a Fifth Wheel. Park is nice but basic. Hosts very friendly. Previous reviews indicated no Verizon connectivity, but that's now corrected. Had good cellular phone connection and used our hotspot for data... excellent connection. Their Grill restaurant is quite nice which is good as it is about the only place in town to eat. We camped at Duke's Slickrock Grill, Campground and RV Park in a Motorhome. There is a small market in town good for bare necessities. 2-3 gas stations with mini-marts. BLM office in town. About 40 miles tonorthend of Lake Powell; about 45 miles to Capitol Reef NP. Nice campground with level, wide sites. We picked our own site and almost had a double site: one for the RV, one for the Jeep. Most sites were pull-thru. We had a reservation. The hook-ups were easy, we had a picnic table and a tree is the Utah desert - what more could we want? Well, closeness to several parks in the area: Goblin Valley, Capital Reef and Canyonlands. How about a good restaurant right on the same property? We enjoyed our week here, would recommend it to others and would definitely stay here again if in the area. We camped at Duke's Slickrock Grill, Campground and RV Park in a Motorhome. The restaurant serves very good breakfast, lunch and dinner. We liked Goblin Valley, hiking through Bell and Wild Horse slot canyons, the Gallery at Canyonlands NP and the dirt roads in Capital Reef NP and the old mill in Hanksville. We drove up from Blanding - what a cool road passing by Bears Ears NM, Natural Bridges NP, hugging White Canyon as you headed NW, crossing the Colorado at Hite Crossing and then sliding through a slot between the river and the cliffs. WOW, what a drive. Location was great to explore national parks in the area. Great restaurant on site. Massive wide space. One big issue, the motel across the street has Friday night outdoor concerts / dances. Finally at 3 AM we were upset and called the motel to find out when they were going to quit. It was very loud even with all windows closed. They did shut down after one more song after we called. We camped at Duke's Slickrock Grill, Campground and RV Park in a Travel Trailer. We used this park while we explored the area and Capitol Reef NP. It was clean and had full hookups. It also had a very nice, grassy area for tents. Sites are all in "large parking lot" type area with a few trees common to this arid part of Utah. Restroom and showers looked nice. There was a laundromat, gift shop, and free wifi. 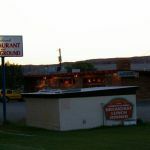 There is also a restaurant on the property. We camped at Duke's Slickrock Grill, Campground and RV Park in a Motorhome. Don't miss Capitol Reef National Park! Nice well kept campground with young trees. We stayed in April for a week in a 40ft fifth wheel and had no trouble getting around (the area at the back for larger rigs is pretty wide open for maneuvering) all gravel roads and sites. level full hookup sites with 30/50 amp service Cabins looked new and well kept. Nice grassy areas for tents and walking dogs. Did not use but they had code entry restroom and also a laundry room. Pretty vacant while we were there but several RVs pulled in each night for overnight stays. Was not able to connect to their wifi at our site (#35) but could pick it up in the front area of the campground. (Restroom to office area) They did tell us that wifi was spotty in areas. Had extended 3G Cell service with Verizon for the most part worked well but a few dropped calls. We enjoyed our stay and staff was very friendly. Will return when we get back in the area. We camped at Duke's Slickrock Grill, Campground and RV Park in a Fifth Wheel. Recently improved campgrounds with very clean bathroom and laundry facilities with good pressure and warm showers. The on site restaurant offers good quality food in a nice setting with great service and live music on the weekend we visited. We would certainly visit again and recommend to others travelling through the region for a short stay. We camped at Duke's Slickrock Grill, Campground and RV Park in a Motorhome. My overall rating is relative to RV parks in general, not those in Hanksville. Duke's is the only game in town, and Hanksville is a great central location for exploring Utah's red rock country. The park is a dirt parking lot with tight sites without patios or tables. 3/4 or more of the sites were occupied by workers for a project on the road to Capitol Reef. With the additional transients like us, the park was full the 3 days we were there. Wifi was OK except at busy times (like after 5 pm) so we had to switch to Verizon 3G. On the positive side, there were large lush grass area for tenters that were great for dog walking. Also, the restaurant was very good. If you want to visit Hanksville then lower your expectations and stay here. We camped at Duke's Slickrock Grill, Campground and RV Park in a Motorhome. The hamburgers at Blondies were disappointing. Next time we'll try Stan's Burger Shack. The new owners,bless their hearts, have done everything possible to improve this 1960 era campground. Everything is clean and ship shape. There is a reason that KOA sold its vintage campgrounds and started over from scratch. No matter what you do to these old campgrounds the RV sites are going to be too short and tight for today's rigs. My trailer is only 22 feet and I had to park my tow vehicle in the tenting area because it wouldn't fit in the site. Even with that I couldn't reach the sewer connections. The tenting areas,however, are great especially those behind the bath house. Tenters can pitch their tents on beautifully manicured green grass and if they walk to the back of their sites they can even have shade. This is only option with hookups between Green River and Torrey. It is a clean/safe place to rest your head. Management will work with you to fit your rig in if they can. We camped at Duke's Slickrock Grill, Campground and RV Park in a Travel Trailer. We stayed for 4 nights in order to see the many area attractions. We stayed in October and the campground was not very full. Our site was gravel, level, and had 50 amp service. The (I think new) owners seem to be making improvements and we would stay here again. The rate is Good Sam. The restaurant serves a good breakfast. We camped at Duke's Slickrock Grill, Campground and RV Park in a Fifth Wheel. 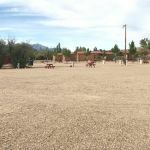 This RV park used to be called Red Rock Steak House and Campground. I believe it is now under new ownership as the young woman who checked us in said something to the effect that they have only had it for two years. It appears that the new management is taking steps to improve things. The bathroom and showers were in good condition. Although there is little if any shade there are newly planted trees between some of the sites that will eventually provide this much needed amenity. That said, the campground is otherwise very basic, with short, narrow graveled sites that are quite close together. On one side a chain link fence separates the campground from what appears to be a junk yard. There are a few nice grassy tent sites. The restaurant serves basic but decent food and the service was good. Given that there are no other parks in the area, this will do for a one night stay. We camped at Duke's Slickrock Grill, Campground and RV Park in a Travel Trailer. Are you affiliated with Duke's Slickrock Grill, Campground and RV Park ?